The Porcichew provides an enriched environment for pigs. The UK Farm Assurance Schemes now demand that all intensively reared pigs have suitable 'enrichment' to keep them occupied. 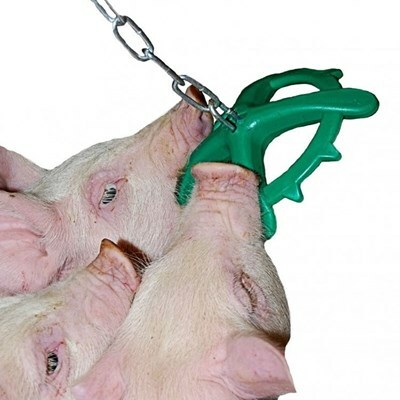 Porcichew is designed to give consistent pig interaction over a number of months. Available in 8 different food grade colours and 8 different food grade scents - all trialled at farm level. The flavours/scents are uniquely encapsulated throughout the product so that the more a pig bites, the more scent is released. A quality obstetrical gel is recommended for use whenever manual intervention is required when an animal is giving birth. It causes less stress and reduces the risk of inadvertently injuring the animal. Kruuse Thermometer. A quality, digital thermometer for use with sheep, goats, pigs and cattle for an accurate, fast read-out. The clear digital display gives a quick reading and provides an audible signal when the peak temperature has been reached. This Kruuse product is waterproof and has an auto power off facility. The battery is non-replaceable but will provide approximately 18 months of use at 10 minutes per day (equivalent to around 100 hours of continuous use). The thermometer is supplied in a neat storage case for added protection as well as an instruction leaflet.